A molded antique brass pin that was my Great Aunt Mable's who gave it to me as she had no children of her own. The center oval has deepish points in it that should 'grip' a molded cabochon (included with the mold) after molding. There are two cabochons in the mold, one faceted and one smooth. Both fit in the center oval of the pin allowing the pin to be made of one color or material and the cabochon another. 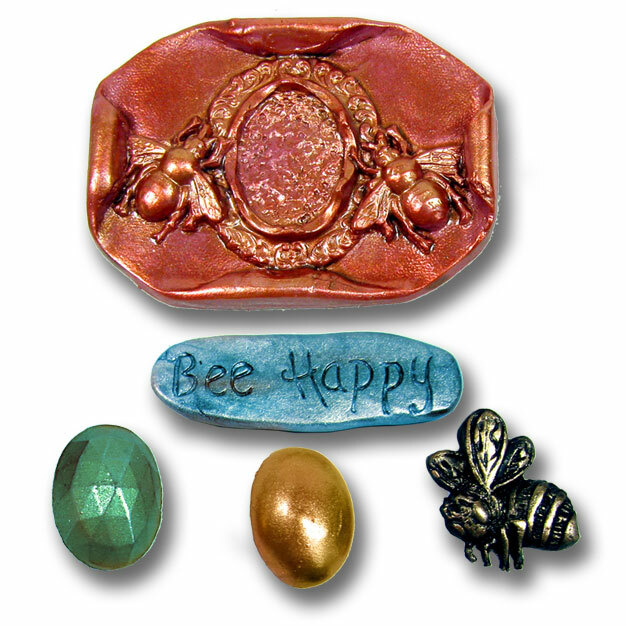 Also included in the mold is a sweet bee and the words “Bee Happy” for imprinting. Overall mold dimensions for this mold is approx. 3.25" by 3.25" by .375 inches thick. Materials up to 150 degrees Fahrenheit (F) can be used in the mold. Instructions included with mold to make this project, a vintage style Pin & Earrings either with or without dangles. The bee design was sculpted by Penni Jo Couch and the pin is a family heirloom. All rights reserved. A molded antique brass pin. The center oval has deepish points in it that will 'grip' a cabochon after molding. There are two cabochons, one faceted and one smooth. Both fit in the center oval of the pin allowing the pin to be made of one color or material and the cabochon another. Also included is a sweet bee and the words “Bee Happy” for imprinting.